In 2012 the people of Bristol gathered around the iconic Bristol Suspension Bridge to welcome the Olympic Torch Procession. Little did they know, Skyburst The Firework Company, had been quietly setting up a welcoming daytime firework display from 11pm the previous night. With the pyrotechnic display all set and rigged by 6am, Skyburst waited patiently for the Torch to reach the Bridge at approximately 8am. The excited crew witnessed thousands of people gather in every surrounding area, just to get a glimpse of the Olympic Torch making its way across the bridge. Nerves running high through both Skyburst and the spectators, the announcement was made that the torch was soon approaching the Bridge. Ready on the big red button, linked to over 500 Red White and Blue Streamers and Mines, Skyburst were finally ready to welcome the Olympic Torch. As soon as the torch entered the bridge, Skyburst welcomed it with a huge explosion of mines from the first tower. Following the Torch Bearer, mines and streamers continued to erupt in vivid colours from the sides of the bridge until the relay was met in the middle to exchange the Olympic Flame. With yet another large explosion, the procession of the torch and pyrotechnics continued its unforgettable journey across the bridge. With the unforgettable procession across the bridge now complete, Skyburst picked the perfect moment to celebrate the occasion by covering the Torch Bearer with Gold Flutter Fetti and filling the streets with dazzling gold. At this point, the cheering people of Bristol thought the showcase was over, but this was not the case at all. Skyburst initiated the final rapid chase sequence of red, white, and blue streamers and mines in succession across the bridge. 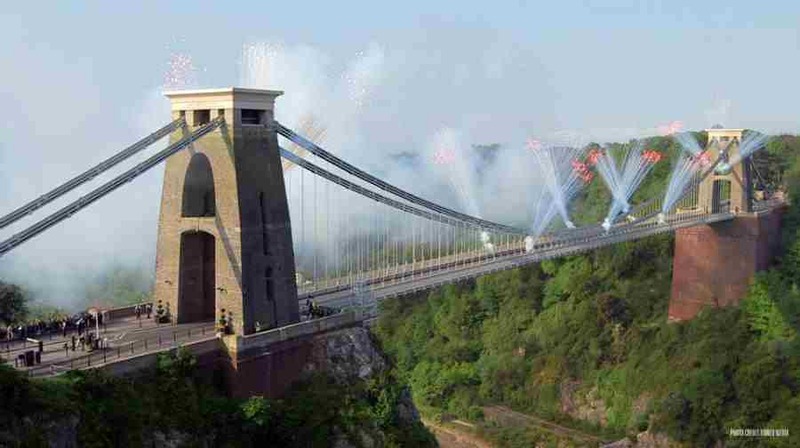 Overtaking all officials on the bridge, the people of Bristol gasp with amazement as they witnessed an array of coloured mines/streamers/confetti, never before seen in Bristol. With a final hit of coloured eruptions from all firing positions, accompanied by an ‘earth shattering KABOOM!’, Bristol had truly welcomed the Olympic torch in style! With the nerves and tension quickly disappearing, all members of Skyburst had beaming smiles and wide grins pinned across their face as they looked back at such a successful morning. With the buzz still emanating from the Skyburst team, they swarm back on the bridge, commencing de-rig and re-opening the bridge for the public. With the final box going back on the van, Skyburst joined the organisers at a Café in Clifton for a well-deserved celebratory Champagne Breakfast. All members of Skyburst felt truly privileged to be given the opportunity to work on such a prestigious site for such a memorable event. Director, Alan Christie, expressed how it had always been his dream to perform on such a historical structure, in such a fantastic city, Bristol. Full video is below. Enjoy! !